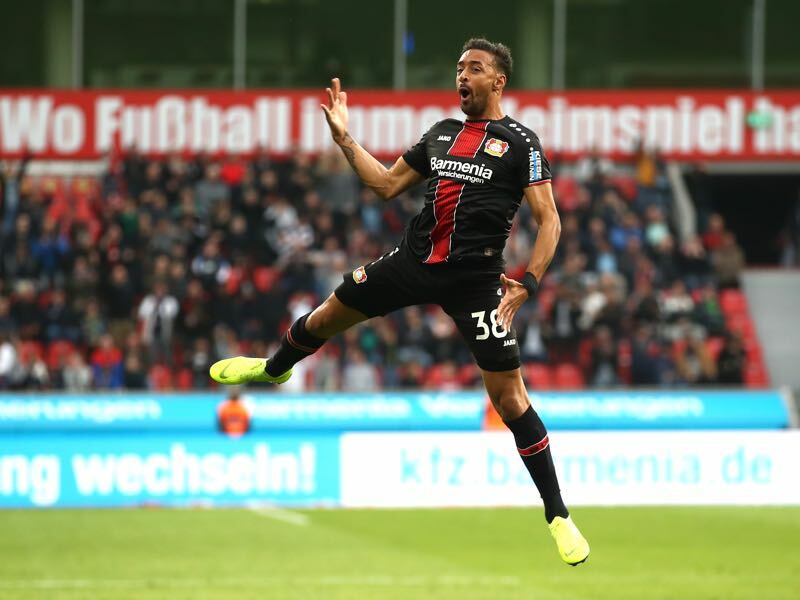 BayArena – Bayer Leverkusen v Hannover 96 ended in a 2-2 draw, as a last-gasp Karim Bellarabi goal rescued a point for the home side in an entertaining finale. Florent Muslija’s free-kick put the visitors ahead with Lars Bender equalising before the break. 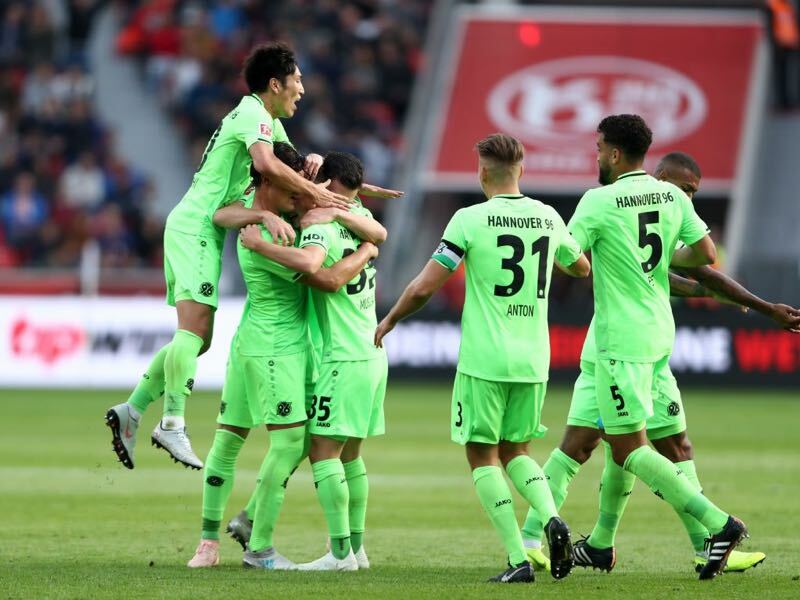 Felipe scored and was sent off in the space of three minutes, Hannover’s attempts to hold on for the final 30 minutes falling desperately short as Bellarabi ruined their party. Bayer Leverkusen had a great chance to take the lead from the penalty spot but Wendell’s weak effort was comfortably saved by Michael Esser. Julian Brandt was in position to shoot but couldn’t pull the trigger, Hannover growing into the game before taking the lead. Florent Muslija’s free-kick kissed the post giving Lukás Hrádecky no chance, the 20-year-old forcing a save from Hrádecky soon after with Bobby Wood’s follow up shot blocked by Wendell. Niclas Füllkrug headed in with the goal ruled out for a foul, Leverkusen responding immediately with Julian Brandt finding Lars Bender who shot across Michael Esser to make it 1-1. Brandt headed wide either side of half-time but the visitors regained the lead from a corner. The ball found Felipe at the far post who fired past Hrádecky to make it 2-1, but the Brazilian defender went from hero to zero in the space of three minutes, a cynical handball earning him a second caution and red card. Kevin Wimmer replaced Bobby Wood as Hannover’s intentions became clear. Dominik Kohr saw a good chance saved as the visitors dropped desperately deep. Heiko Herrlich brought on Karim Bellarabi and Leon Bailey as Sven Bender flashed an effort wide. Esser received a caution for time wasting but Hannover couldn’t hold on. Bailey started the move, Lars Bender finding Bellarabi who cut inside and unleashed an unstoppable left footed shot past Esser. Lars Bender had a final chance to score the winner, his shot punched away by Esser as the match ended 2-2. Florent Muslija started his first Bundesliga match with Ihlas Bebou injured, having a strong game in a free attaching role behind Füllkrug and Wood. The 20-year-old stepped up and struck a perfect free kick off the post to give Hannover the lead, forcing a great save from Hrádecky minutes later. Muslija was busy across the front line, finding space and looking the most likely to link up with Hannover’s strikers. He started the second-half by drawing a foul from Mitchell Weiser which provided a free kick in a dangerous position, but suffered after Felipe’s sending off. Forced to play a defensive role with his side down to 10 men, Muslija’s effectiveness became negligible before he was replaced by Matthias Ostrzolek in the 68thminute. It has been a remarkable start to life at Hannover for Muslija, who was playing for Liga 3 club Karlsruher SC less than two months ago. Playing against Hannover in the 6-1 defeat in the DFB-Pokal first round, Muslija impressed enough for the Reds to sign him on a permanent deal for €1.4m. After marking his Hannover debut off the bench with a consolation goal in the 4-1 defeat at Eintracht Frankfurt on Matchday 6, it wouldn’t be a surprise to see him become a first team regular. The 23-year-old Brazilian stamped his mark on the match in the early stages, with his tough, physical no nonsense approach putting Leverkusen’s midfielders on notice. Confidence looks to be in plentiful supply following his third appearance for Brazil during the international break. Walace had a tough time at Hamburg but looks to have found a home at Hannover and is flourishing in central midfield. With his side down to 10 men, Walace took it upon himself to bring the ball out of defence and initiate counter attacks. He can’t be classified as a holding midfielder despite his aggressive style and love for tackling. Walace outclassed Leverkusen, particularly in the second half, showing the home side exactly what they are missing. Die Roten have bounced back after four straight defeats and are playing some effective football. They have a strong spine with Waldemar Anton, Walace and Niclas Füllkrug and flair in Ihlas Bebou, Florent Muslija and Linton Maina. André Breitenreiter’s side are by no means in the clear, but recent performances indicate this team shouldn’t be fighting a relegation battle. I anticipate Hannover overtaking Nürnberg and Freiburg in due course and surviving their second season back in the Bundesliga. 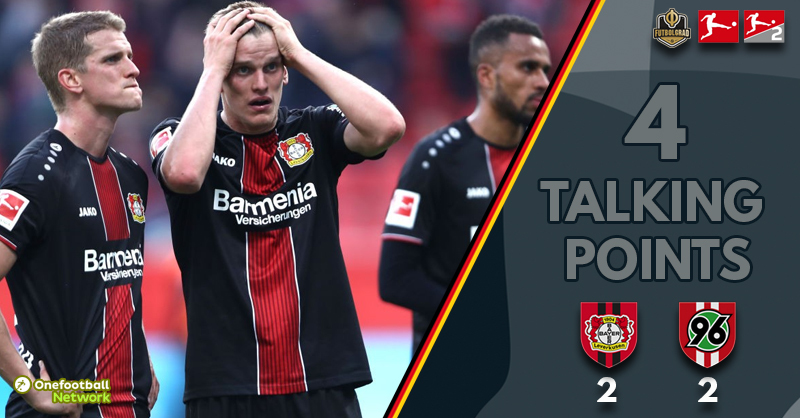 Bayer Leverkusen v Hannover 96 – Revival? Bayer Leverkusen rebounded from losing their opening three Bundesliga matches but it was far from convincing. Wins against Ludogorets, Mainz and Fortuna Düsseldorf couldn’t hide the fact that there are many tactical flaws in this team, exposed ruthlessly by Borussia Dortmund in the second half of the 4-2 defeat at the BayArena. Luck is a big part of football, but the reality is a team of Bayer Leverkusen’s ability should be playing better and picking up more points. There was little movement from the attacking players, too static which made it easy for Hannover to defend. It’s going to be a testing few weeks for Bayer Leverkusen with matches against Werder Bremen, Borussia Mönchengladbach, Hoffenheim and Leipzig coming up. The Werkself are worryingly close to the relegation zone, sinking into the bottom three is a real possibility.